Politico has an interesting profile on Kate Brown, Oregon's next governor who will serve until November 2016 in an interim role. According to the website, the 54-year-old Brown was first elected to the state House in 1992 and moved to the Senate a few years later where she became the first woman to serve in the role of majority leader. She hasn't addressed her sexuality much publicly, save for an apparent essay for "Out and Elected in the USA," a survey of gay officeholders conducted by the website OutHistory.org. A Brown spokesman declined to confirm or deny the authenticity of the essay. 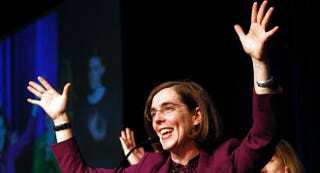 Brown's promotion was announced on Friday after John Kitzhaber stepped down in the middle of a corruption scandal. There are about 525 openly LGBT public officials in office at all levels of government, according to the Gay and Lesbian Victory Fund. Most of them are Democrats, said interim executive director Denis Dison, and only about 20 are Republicans.